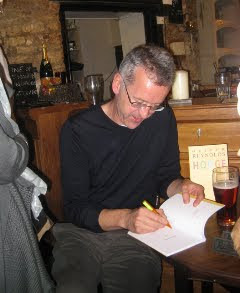 Another very well attended poetry reading at The Woodstock Arms - over sixty people came to hear Christopher Reid and Oliver Reynolds reading from A Scattering, The Song of Lunch and Hodge. We were lucky to hear poems from Hodge as the book isn't published until later this month. It is beautifully produced - you can just see it behind Oliver Reynolds in the photo above. Oxford-based Arete have published the poetry collections - The Song of Lunch was first published by CBeditions and has just been brought out by Faber.